I think many of us were thinking this spring was going to end up like 2010 or 2011. Those were especially cool and wet springs. This May has been VERY different. Check out the extremely cold anomalies across the entire Western USA those years and compare that to this month. The pattern ahead looks like pretty typical late May and early June weather. A slight chance for a shower tomorrow afternoon, better chance tomorrow night and Thursday, then showers mainly disappear Friday midday through the middle of next week as temperatures warm to above normal once again. 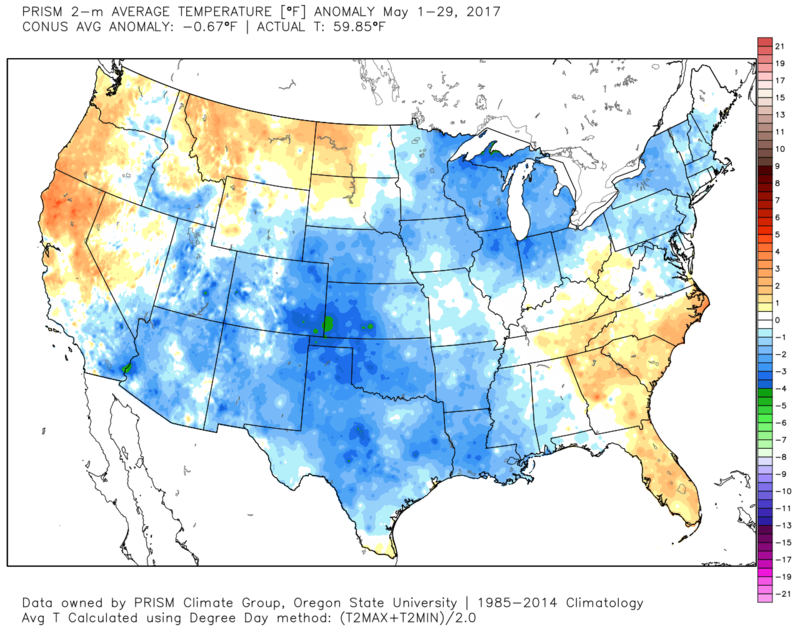 So we’ve broken out of the cool/wet pattern that much of Spring 2017 was. 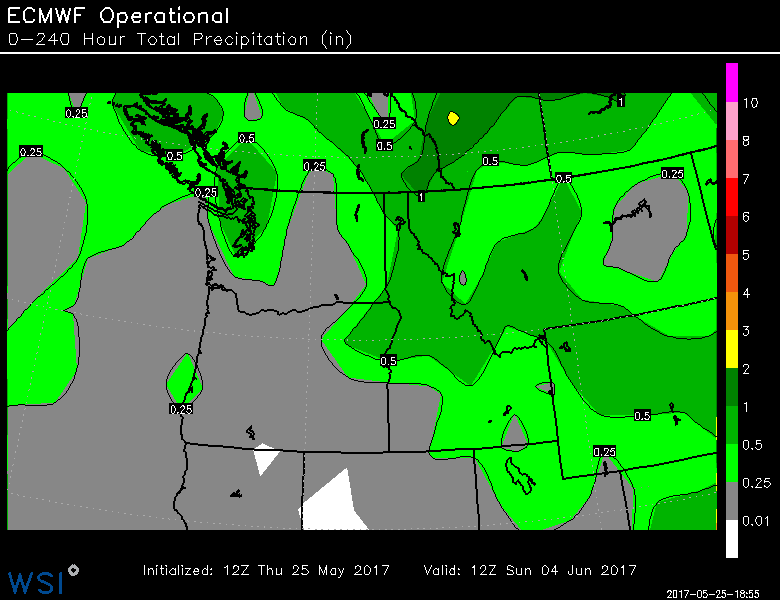 Now early summer 2017 (early June) looks pretty normal…at least the first week of it. Enjoy! 69 years ago today, what was once Oregon’s 2nd largest city was erased from the map in hours. 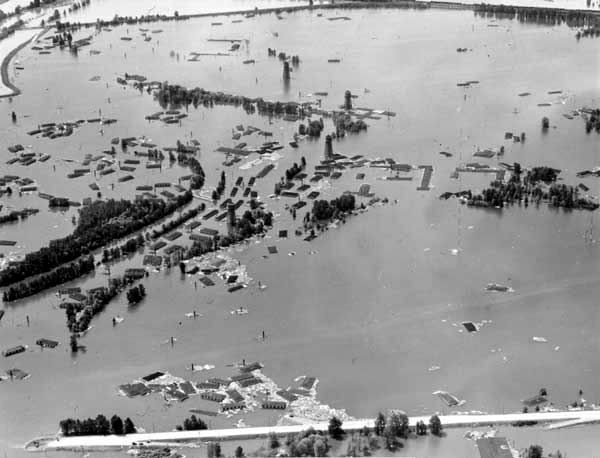 If you’ve never heard of the Vanport Flood, read on…it only happened 5 miles from downtown Portland. 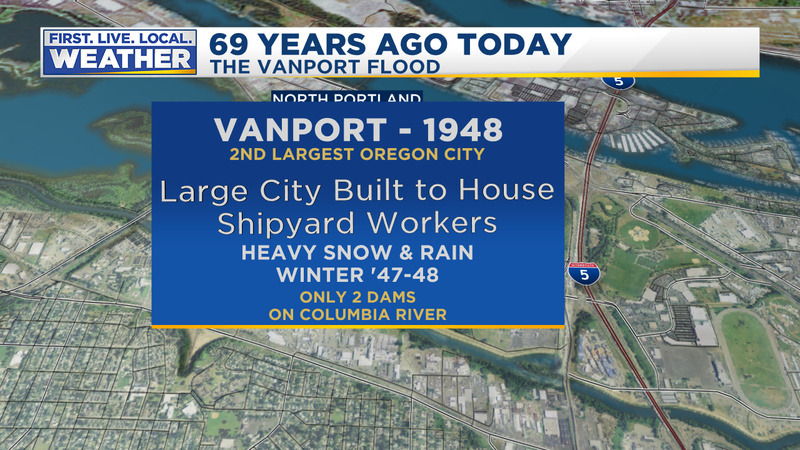 I love weather AND history, so I find this flood fascinating, especially since it’s results echo through Portland even in 2011. I’ll be brief, since it’s a long story. During World War II (1940-45), huge numbers of workers were brought in to work in the shipyards here in Portland. 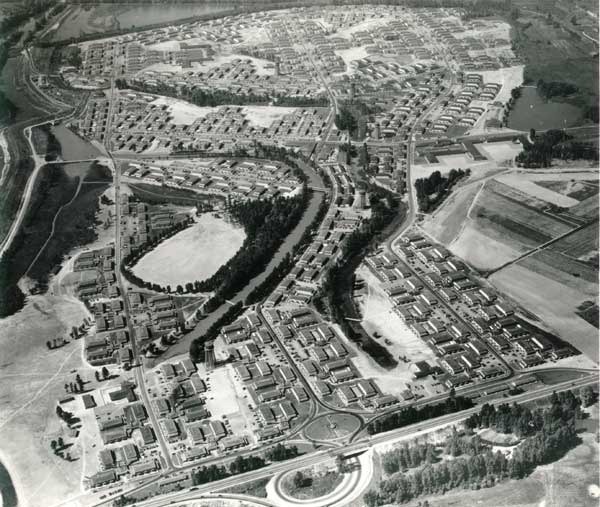 There was an urgent need for housing, so a city was quickly built and called VANPORT (Vancouver+Portland) on the flats north of Portland. That’s the low area west of I-5 around Delta Park where PIR, Heron Lakes, and Delta Park West is now. That city contained 40,000 at it’s peak, making it the 2nd largest city in the state! After the war, lots of folks moved away, but there were still around 13,000+ residents there by the Spring of 1948, three years after the war ended. Even a college had opened in the city for the returning GI’s…the Vanport College. The winter of 1947-48 brought massive snowfall to the mountains of the Pacific Northwest and Rockies, along with lots of rain. At this time there were very few dams to hold back spring floods on the Columbia and Snake Rivers…although Grand Coulee and Bonneville Dam both were operational. The Columbia River rose throughout May 1948 and by Memorial Day Weekend was approaching the 30′ level on the Vancouver gauge. That’s within 4′ of the all-time high in 1894. For comparison, that 1948 level is about 14′ higher than the river is right now! I notice the Portland Housing Authority had put out a notice in the week before saying “REMEMBER: DIKES ARE SAFE AT PRESENT. Interesting to note that the river kept rising, and peaked about the date this picture was taken…at exactly 31′ on the Vancouver gauge. The flood was the 2nd highest on the Columbia River since record keeping began in the 1800s. 1. About 1/3 of the residents were of African-American descent; largely settling into north and northeast Portland following the flood. Lots of good information about this online which is way out of the scope of a weather blog, but really interesting, especially considering current demographic changes in the area. 2. Vanport College was called “the college that wouldn’t die”, restarted in downtown Portland, and became Portland State University. 3. The town wasn’t rebuilt, but became a raceway, a park, golf course, and wetlands. 4. The Flood Control Act of 1950 spurred more dam building along the Columbia and it’s tributaries, due to the 1948 flood. Here it is, the Thursday evening before Memorial Day Weekend and it looks like summer on the weather maps. Now each year I like to point out that the traditional “start of summer” weekend is generally nothing like summer in our area. 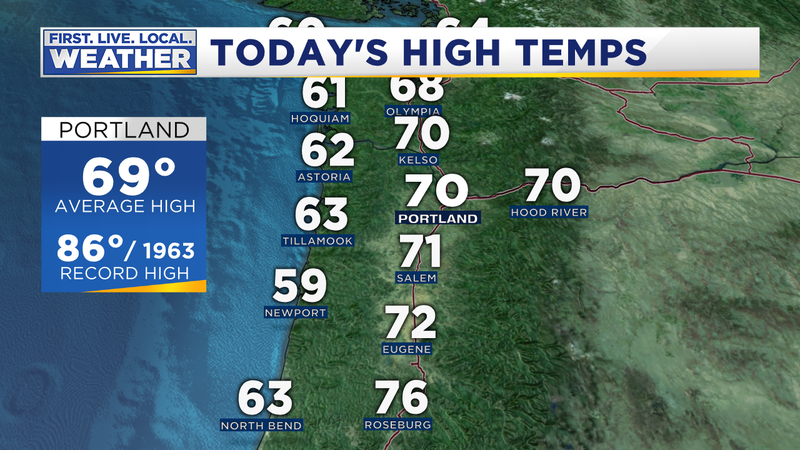 Our AVERAGE high this time of year is 70 in Portland; that’s the same as early October! And the chance of getting showers on at least one of those 3 days is relatively high. Oh, but this year is TOTALLY different. 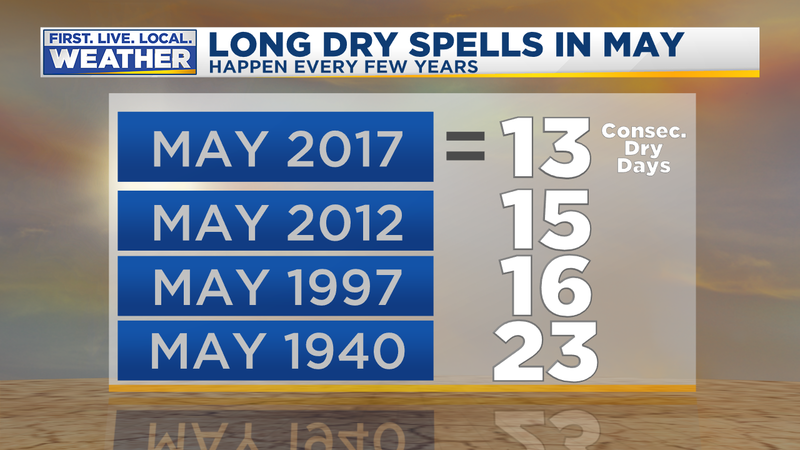 We’ve seen an unusual late May warm & dry spell. 8 days dry so far with 6 more to go (through Wednesday). Who would have thought we’d see 14 consecutive dry days! 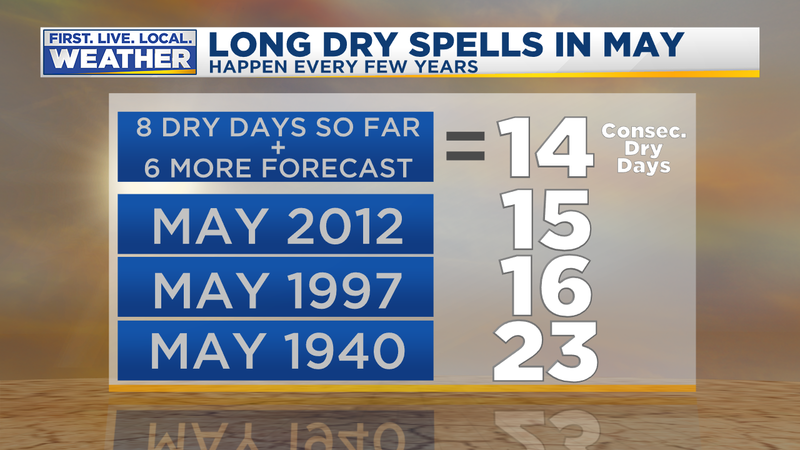 By the way, the longest dry spell WITHIN the month of May WAS that 23 day period in 1940 on the graphic. 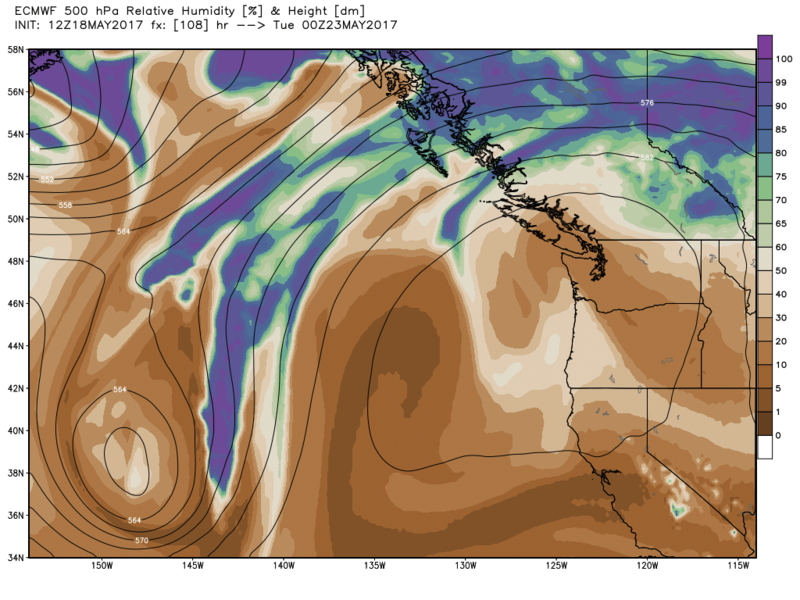 Then beyond that time the ridge breaks down and we finally get a showery pattern (maybe for just a few days…unsure) beginning next Thursday. WHAT DOES THIS MEAN FOR MEMORIAL DAY WEEKEND? It means we’ll see a historic weekend, most likely one of the warmest or THE warmest on record. I have only checked records back to 1987 (ran out of time), but this will be the warmest/driest in those 30 years. 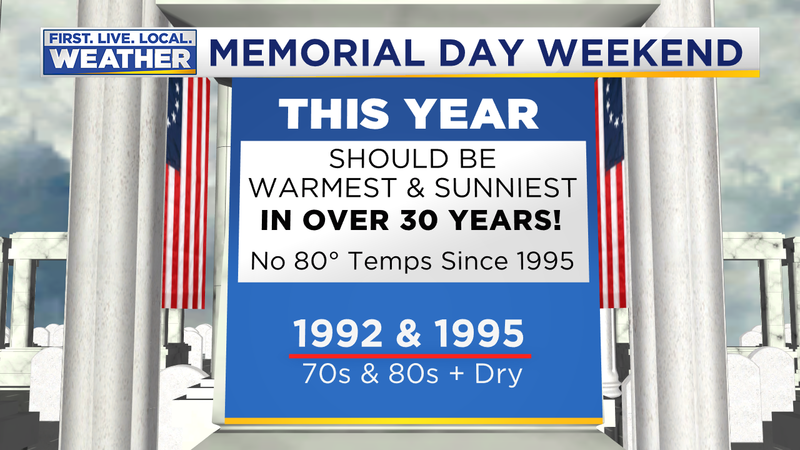 In fact we haven’t even hit 80 degrees in 22 years during this holiday weekend! With 850mb temps up around +16 to +20 Saturday through Monday, weak onshore to weak offshore flow should allow temperatures to rise up to around 90 degrees. Warmest days appear to be Sunday and Monday. We were close in 1995, with highs 78-87-86. That was the weekend the Grateful Dead was in town. I remember heat exhaustion issues (likely fueled by something else?) at Delta Park with that concert. 3 years previous in 1992 we reached 87-93-78. So enjoy the summer-like weather this weekend and try to stay cool if you are indoors. At least relative humidity will be low through the weekend. Forecasts turned out just right today with 80s along parts of the coastline and low 90s around the metro area. Aurora was the warm spot in our area with a 93 degree high. Somehow Eugene only hit 85…not sure what was going on down there. Tomorrow will be much cooler at the Coast as a strong NW wind kicks in during the afternoon. That will also pour inland and cap our temperatures off in the lower 80s. Good news, no hot weather for tomorrow but a warm and sunny late May day. 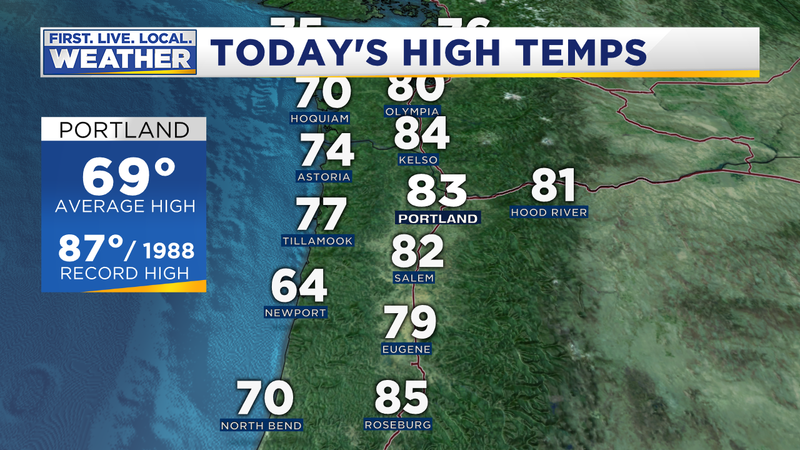 Now today’s 91 at PDX was the warmest in May in 3 years but short of the record for the date. We have entered an unusually long warm/dry period for late May. Since I don’t expect showers Wednesday, that means ridging will take hold again for the end of the week through early next week. No model shows any decent chance for significant cooling and/or showers until at least the middle of next week. Wow, what happened to the cool/wet spring??? Enjoy the sunshine in the days ahead, it’ll be accompanied by low dewpoints Wednesday through Friday so night will be cool with pleasant afternoons. Temperatures will likely peak earlier than normal Tuesday (early to mid-afternoon) as a strong northwest wind begins to blow west of the Cascades. Gusts to 30 mph are likely by 5-8pm as a much cooler airmass pours inland. What happens beyond Wednesday as we head toward the first big holiday of Summer 2017? Believe it or not, there is some good news…it’s possible we have a very nice 3 day weekend on the way. 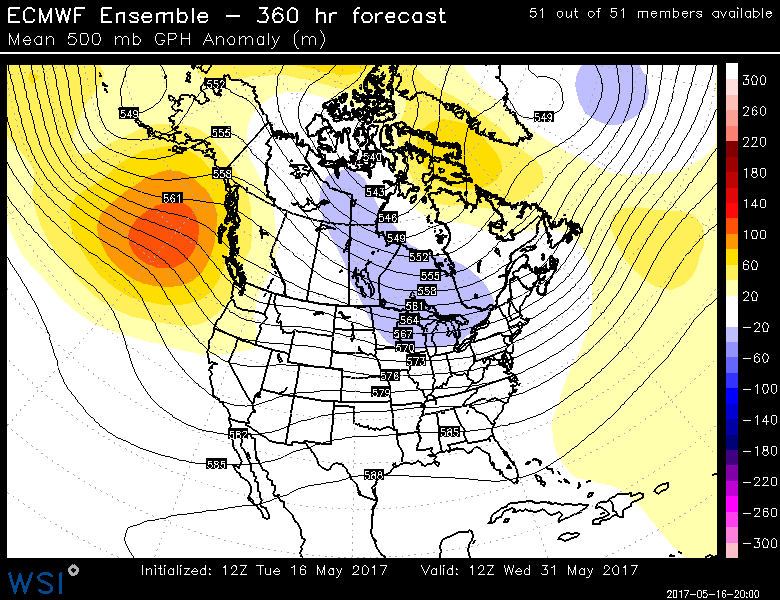 I’m scared to jinx it, but as of now there is pretty good agreement that upper-level ridging is going to rebuild along the West Coast. Nothing extreme, but a very pleasant June-like pattern with above normal temps and mainly (or all) dry weather. 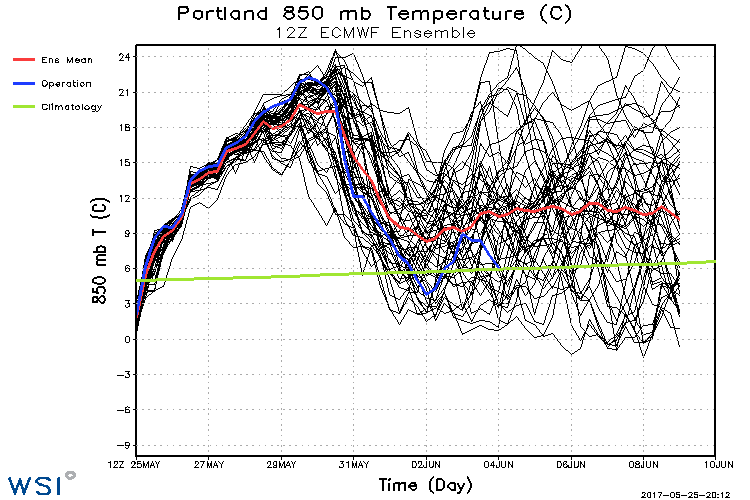 Check out the 12z ECMWF model 850mb ensemble chart. This shows the next two weeks. The green line is average temperature in celsius for the date at around the 5,000′ elevation. 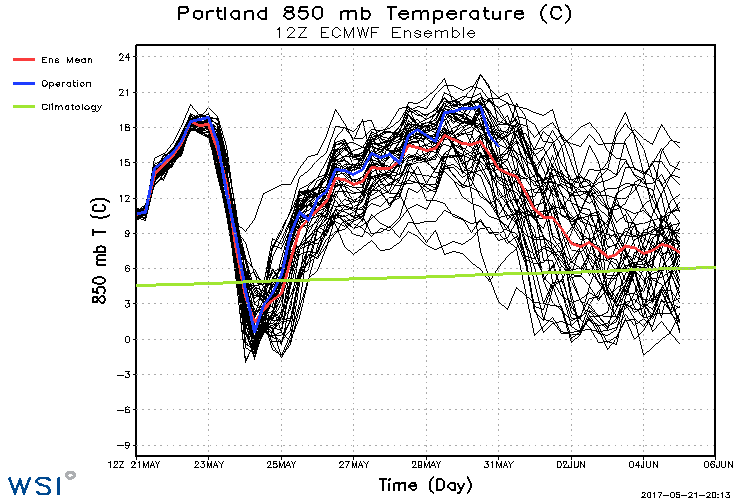 Blue line is operational ECMWF run, red is ensemble average. The screaming message here is that we’ll have that brief chilly day or two Wednesday & Thursday, then a warming trend that just happens line up with Memorial Day Weekend. I’ll have to check the records and see when we last had a warm and mostly sunny Memorial Day Weekend…can’t remember. Confidence is relatively high since NO ensembles are below average until AFTER the weekend. 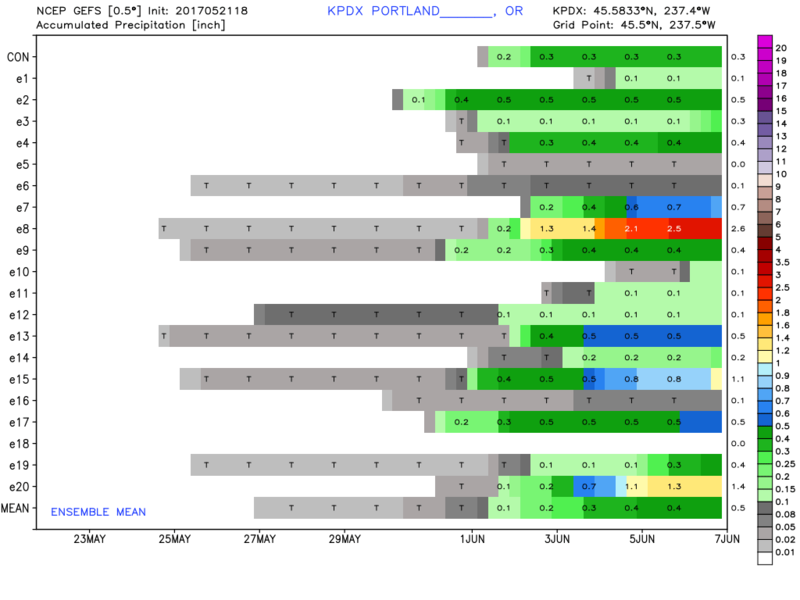 One other interesting tidbit…from the GEFS (GFS ensembles). This is a rainfall chart for the next 16 days, each horizontal line represents accumulated rain as you go from left to right (current time is left side). 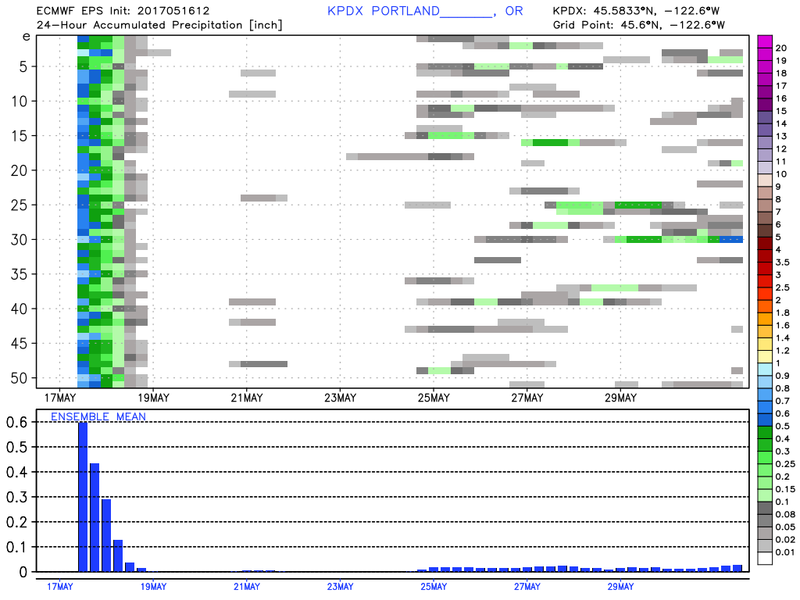 Note only 1 of the 21 ensemble members has measurable rain before May 31st. That’s a week from Wednesday. It appears May is going to end on a mild and mainly (or all) dry note. That’s quite a change. If this is the case, it’ll break the 5 month cold streak we’ve had going since December. And it’ll be our first drier than normal month since January…it’s time I suppose. 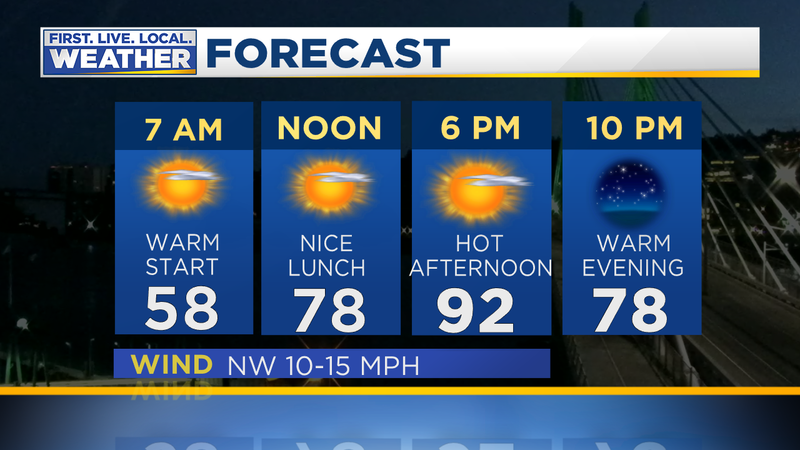 Enjoy the sunshine and stay cool tomorrow. At least it’ll only be hot for a few hours in the afternoon. High pressure is strengthening over the Pacific Northwest as the cold upper-level trough has moved off to the east. In general high pressure will dominate our weather for the next week. Temperatures climb tomorrow with very weak onshore flow and a warmer atmosphere overhead. 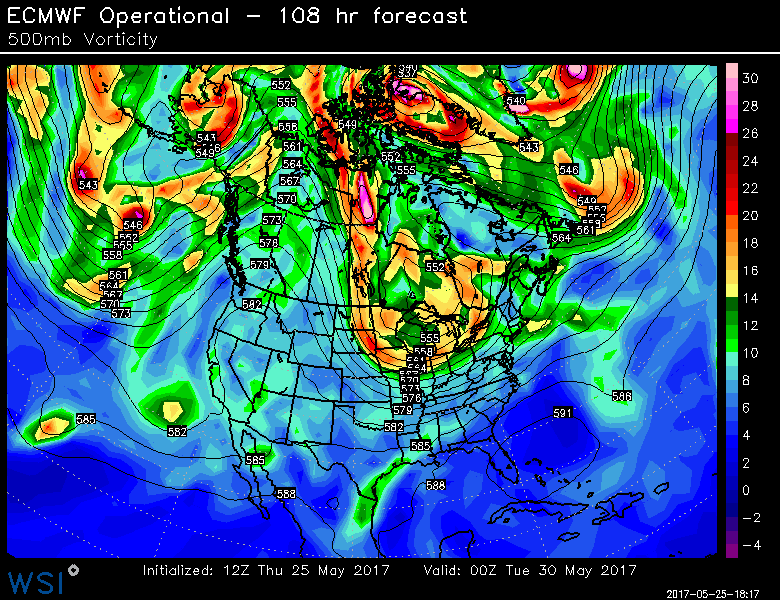 Sunday through Tuesday a big upper-level ridge builds with 500 millibar heights above 585 dm. That is a summertime ridge and air overhead will be warm like summer. Models are in excellent agreement that 850 millibar temperatures (the temperature around 5,000′ elevation) will rise to around +15 (celsius) Sunday, +19 Monday, and +20-21 on Tuesday. That’s just plain hot overhead. On Monday and Tuesday easterly flow at that elevation lowers pressure west of the Cascades. It appears all day Monday through early Tuesday what we call a “thermal trough” will be located quite close to the coastline. A thermal trough is a very warm area of low pressure that forms in the lee of the Cascades/Coast Ranges. In this case, with it getting out along the coastline, temperatures should skyrocket at the beaches just like in the valleys. Most likely that happens on Monday; that IS the one day that should be a scorcher on the beaches…80-90 is possible out there. Here in the metro area, if we combine May sunshine, offshore wind flow (both Monday & Tuesday), and those 850mb temps? We get a high temperature somewhere between 92-98 based on past setups in May just like this. Highest temps are likely on Tuesday assuming no onshore flow begins. As a result I raised 7 Day forecast high temps a could degrees again today. So when might it rain again? 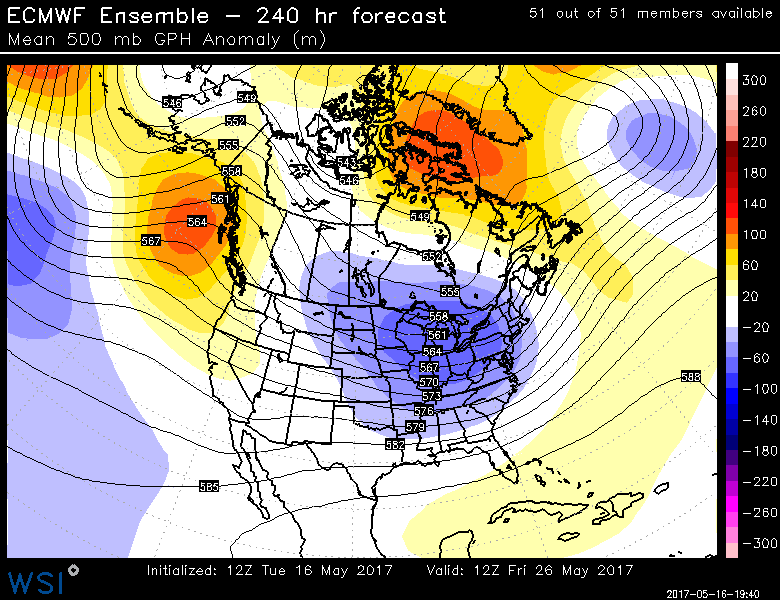 Some ensemble members of some models imply a weak upper-level low could bring showers/clouds Thursday and beyond next week. That said, more members are remaining dry through Memorial Day Weekend than wet. 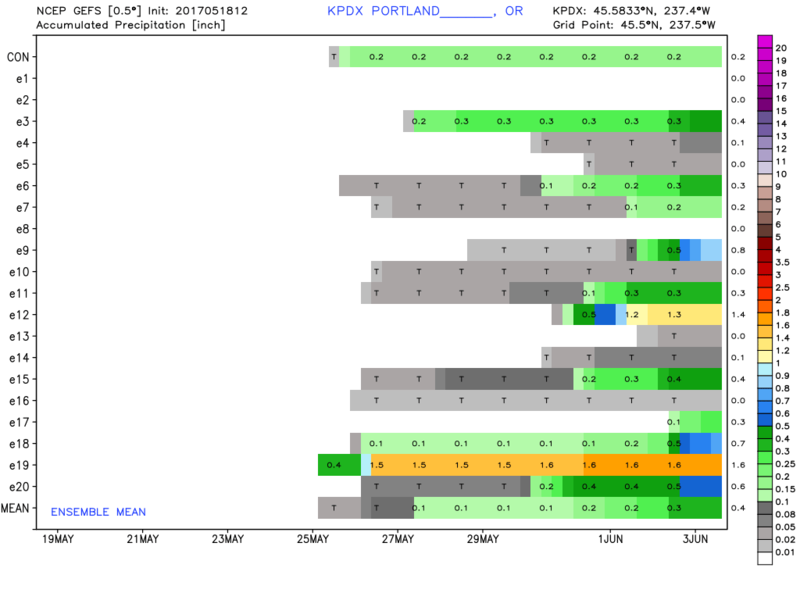 Only 5 of the 21 GEFS ensemble members give PDX .10″ or more rainfall by the end of that holiday weekend. Each of the horizontal lines below represents 1 of those 21 members. Time goes from now on the left to the 3rd of June on the right. The ECMWF ensembles are similar…11 of 51 members produce .10″ rain in the next 10 days. Only 4 have .50″ or more. 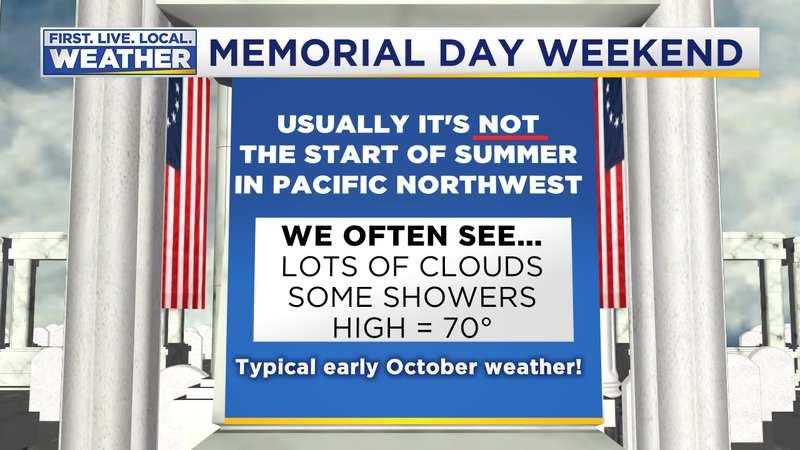 Basically we MIGHT get a few showers as we head toward/into Memorial Day weekend, but as of now there’s no reason to believe a long spell of cold and showery weather is coming back before the end of the month. There’s also no sign that hot weather continues beyond Tuesday. 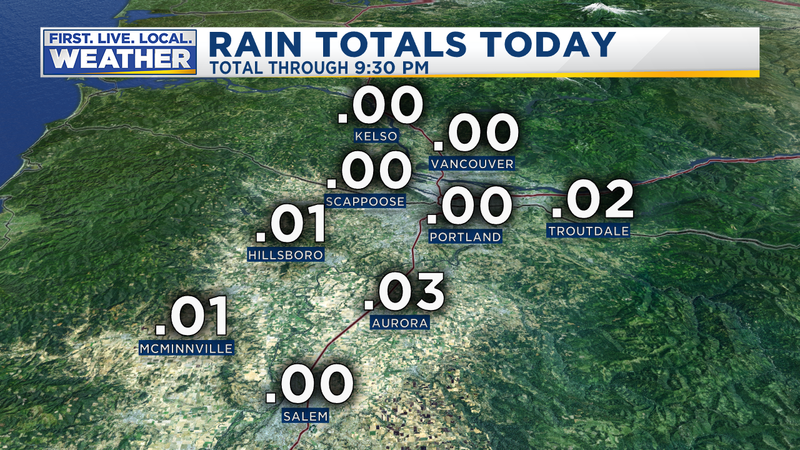 Today a cold upper-level low was moving over the Pacific Northwest, setting off hail and thundershowers. Plus a huge snowstorm in the Cascades. 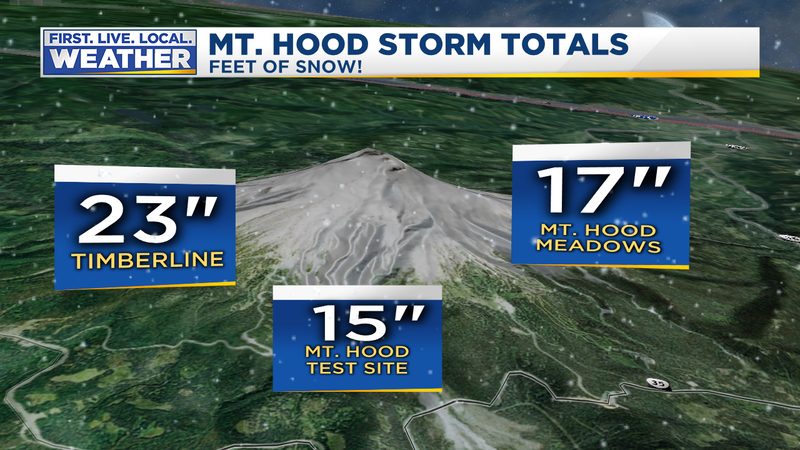 Snow is still falling up there, and about 2 feet has fallen at Timberline Lodge! Other than some leftover snow on the passes briefly Wednesday AM, we warm up and you can forget about mountain snow. A big warmup is on the way. Models have done a very good job forecasting a big change to warm and mainly dry weather beginning the middle of this week. Sure enough, we’ve got a cold love moving overhead now, but check out the big upper-level ridge that develops right along the West Coast late this week and into early next. This map is the forecast for Sunday PM. With 850mb temps moving into the +10 degree range Friday and Saturday, we’ll get well into the 70s (tempered a bit Saturday by onshore flow). Then Sunday through Tuesday the airflow over us goes northeast or even light easterly. We’re in “prime sun angle” time of the year now. We’re getting just as much energy from the sun as we would be in late July. 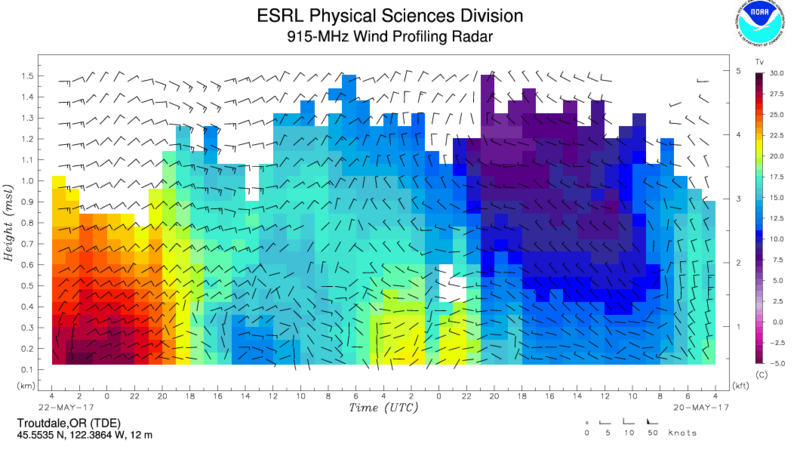 So with clear skies, 850mb temps +17 to +20, and weak/moderate offshore flow…temperatures are going to soar. Sunday we should make it into the low-mid 80s. Then 90 is definitely achievable both Monday and Tuesday. All global models are in quite good agreement with this “hot” period Sunday-Tuesday. The record high for Monday is 95 and 93 for Tuesday…it’s not unheard of to see 90 in late May. Still, it’s hard to believe but we’ll be watering the plants on our decks and in patio containers 6-7 days from now or that Timberline will be in the low 70s next Monday and Tuesday. 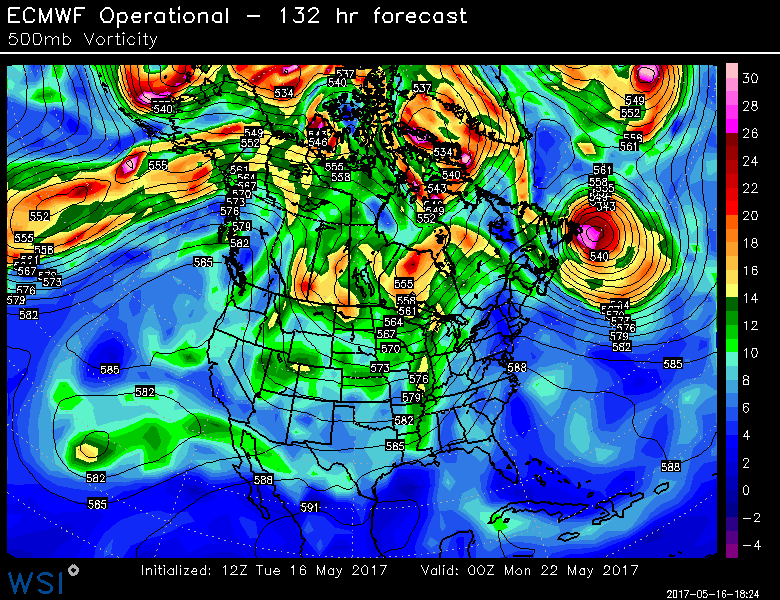 Then 5 days later…the last day of May…looks similar with that ridging to the west. This is typically a very dry pattern in spring or early summer with no wet systems approaching from the west. 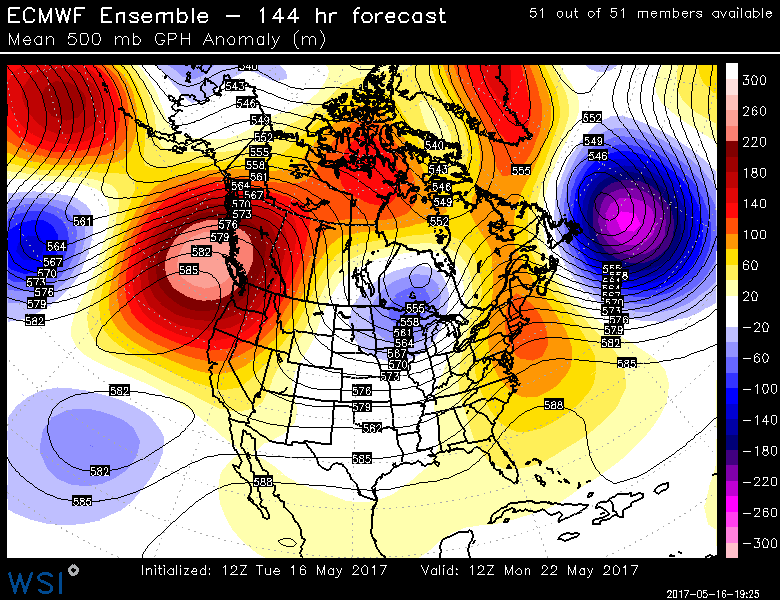 This chart shows the 51 members of the ECMWF model’s “ensemble”. That’s 51 different versions of the same model run with slightly different initial conditions. When they are all in pretty good agreement our confidence goes up. When they are each different, confidence goes down. In this case each horizontal line is one member and represents 24 hour rainfall. Notice extremely good agreement that no rain falls Thursday through next Wednesday. Beyond that you only see scattered showers trying to show up here and there. 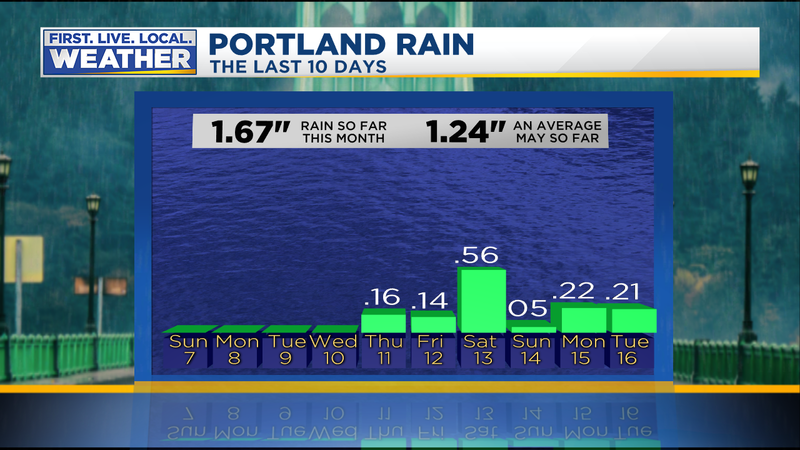 So a drier than normal pattern for the next weeks. On another note, we’ve got a new member of the weather team! I’d like to call him “Mini-Mac”. 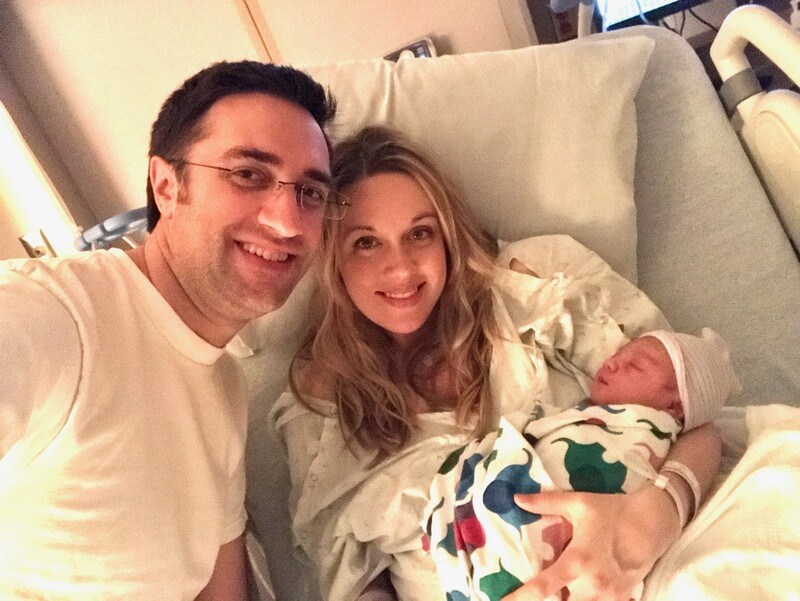 Brian MacMillan & his wife Ashley have a new family member. Little Evan MacMillan was born late yesterday evening…a solid 8 lbs too. Congratulations! 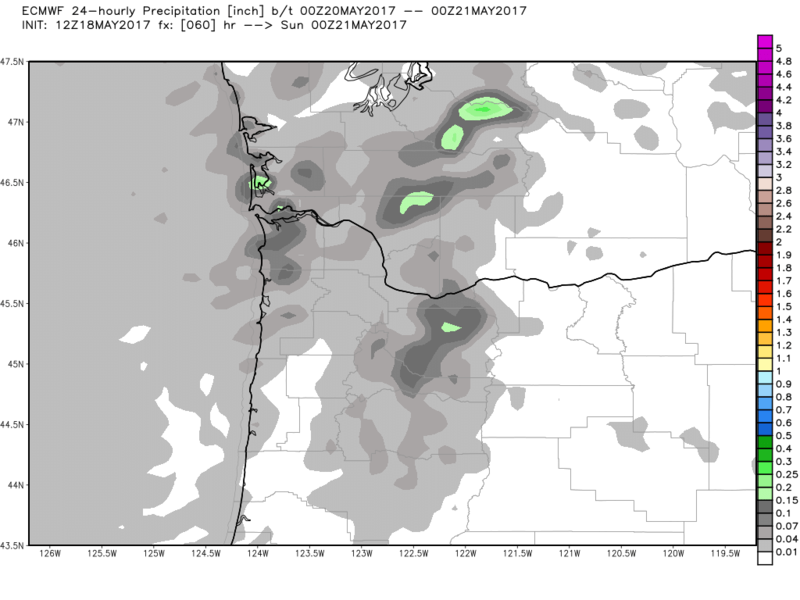 You are currently browsing the FOX 12 Weather Blog blog archives for May, 2017.